Word searches were always fun for me growing up. I'd buy big books with a plethora of them inside. While I don't delve into word searches much nowadays to kill time, I jumped at the chance to review Lightwood Games' Word Search by POWGI for the Wii U and Nintendo 3DS eShops. Here are my quick thoughts on the title, as you can only go so far in-depth with a collection of word searches! Seeking a capable word search package? You've found it. It's difficult to make word search games sound any more special than they are. With Word Search by POWGI, you can pretty much guess what you'll be receiving just by the name-- word searches. How do you make that sound any more exciting than that? Well, you really can't, so if you're not a fan of word searches, there's nothing for you here. However, if you enjoy searching for themed words horizontally, vertically, diagonally, and in reverse in a sea of letters, then you will most likely very much like Word Search by POWGI. That said, there's plenty of word search puzzles to be found within this collection by Lightwood Games. 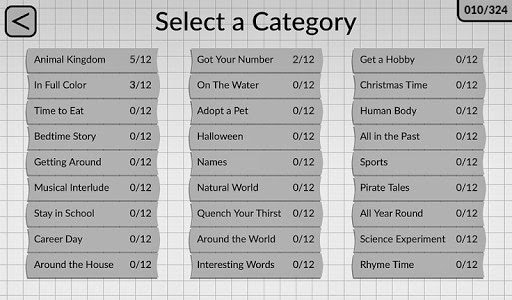 There's over 300 unique puzzles sprinkled within 27 unique categories (e.g. terms regarding sports, baking, fruits, vegetables, world destinations, and so forth) containing an abundance of words to seek out in each. When all of the words have been found in a given puzzle, you've successfully completed it. It doesn't get any simpler than that. Well, unless all you had to find was one of the 20+ words in a given puzzle, but that's just splitting hairs. twelve puzzles each inside of them. 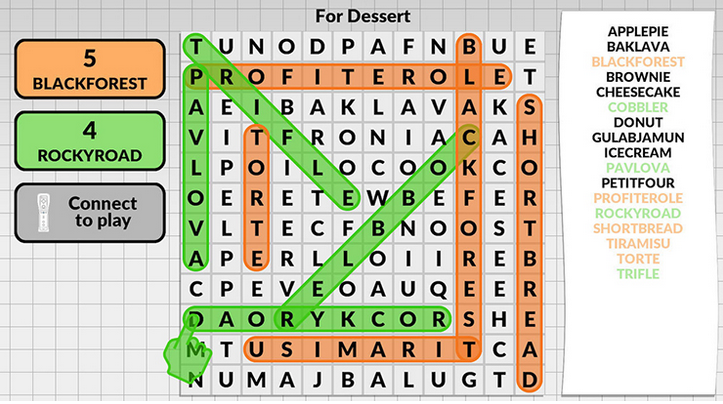 Word Search by POWGI provides an easy to use interface that works well, albeit nothing that will really wow players. You see, there's not much in the way of interesting visuals or different themed appearances to be found in this collection of word searches. It's a shame, but for the lack of visual variety, there are plenty of puzzles to play, as stated. All that is required of the player to find words is to press the stylus on the first letter of the word, and then draw a line to the final letter of the word, thus successfully seeking a word. Again, it's simple to use and it works well. Perhaps the only niggling presentation problem within Word Search by POWGI is that there is but one song that plays regardless of which menu or spot you are at in the game. Definitely queue up some of your own music ahead of time before playing this game. Play with up to four other friends or family members. The differences between the Wii U and 3DS versions of Word Search by POWGI are small, but they are worthy of mention. For one, confusingly enough, the more pick-up-and-play version of the game, the 3DS version, lacks a Quick Play option, which the Wii U game possesses. One would think it would at least be the opposite, with the 3DS version having a more pick-up-and-play approach option to it. Additionally, while the 3DS version is meant for solo players to enjoy, the Wii U game has a multiplayer feature. Up to four others in the room can use Wii Remotes to join in on the seeking and searching fun, helping out the GamePad player on any puzzle within the game. For a game that is purely devised up of word searches, Word Search by POWGI does its job and does it well. There are no special bells and whistles to be found in the package, but the package itself has plenty to gorge on for word search/seek and find enthusiasts. Lightwood Games offers a lovely word search game that might not impress with its presentation, but it does impress with the amount of puzzles the game possesses. Review copy provided by Lightwood Games.